At the times of an economic crisis wars have to be fought fast, efficient, and on the cheap. 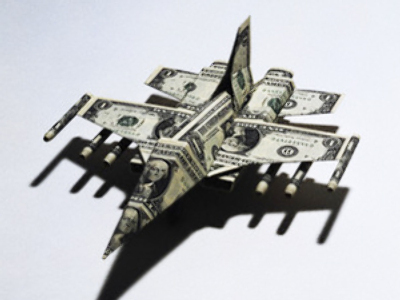 Fighting wars costs money. The more sophisticated weapons one employs, the more it costs. Somalia's Shabaab militants fight with AK-47s and drive around in battered pick-up trucks. Their war effort is cheap, but it's only cheap for them as a group. In relative terms it is very expensive for the already poor economy of the country. With the world gripped by the worst economic crisis in 80 years, can anybody even afford a war anymore? “Further escalation in Gaza could cause more budget expenditures on homeland security and could result in a decrease in Israel’s credit rating and an outflow of capital from foreign investors”. The central bank of Israel issued its forecast on November 20, saying that economic growth may ease to 1.5% next year, its slowest pace since 2002, when Israel was in the midst of its deepest recession. Simply put, Israel cannot afford to wage a costly high-tech war indefinitely. More modern Israeli-developed, precision guided, air-to-surface AGM-142 Have Nap “Popeye” missiles cost a whopping $US 500,000 per unit according to Deagel.com. Hel HaAvir, the Israeli Air Force, was lobbing hundreds of those into targets in Gaza since Saturday December 27. You do the math. The Israeli defense budget may be an impressive $US 18 billion, but at this rate it is burning through the money. Israel's war against Hezbollah in 2006 cost the country about 1% of its GDP, or roughly $US 1.6 billion. These days Israel simple cannot afford such costs. With Obama's administration having to deal with crises at home, the U.S. might not be as easily persuaded to pay the difference between Israeli defense budgets and its expenditures. Last year alone, the annual military grant the U.S. gave to Israel amounted to some $US 2.2 billion. Israel does not want to leave Hamas any breathing space, but if the war drags on much longer, Israel might be out of breath itself. Several thousand kilometers to the East another conflict is brewing. India and Pakistan have been at odds with each other since 1947. Since that time the two countries fought four wars over Kashmir, and have more or less fought themselves to standstill. Neither side can afford the expense now. Both countries have been hit by the ongoing economic crises: Pakistan severely, India less so. Pakistan is close to effectively declaring bankruptcy and is currently asking international organizations for an emergency loan of $US 100 billion. India, where the economy was growing rapidly in the last few years thanks to global demand for skilled and cheap Indian workforce, is doing comparatively well, but the demand for the country has to offer is rapidly slowing. The last thing Indian economy needs now is prolonged and costly military engagement, especially with its nuclear-armed neighbour. Lashkar-e-Taiba (LeT), was allegedly set up by the Pakistani security agency, the ISI, in the 1980s to fight Indian rule in the disputed Kashmir region. It is said to be behind many brazen terrorist attacks in India, including the latest one in Mumbai. These days the Indian military is watching the Israeli air strikes on Gaza with keen interest. It is likely that they would wish to do just the same: a massive and hopefully precise strike on known LeT camps in Pakistan. However, the difference between the two theatres is huge. So, logic dictates that waging wars during economic crises is a silly idea, but wars are rarely fought with logic. Otherwise we would never have seen U.S. troops in Iraq. It was suppose to be a quick and efficient war. The Iranian army after the Islamic revolution of 1979 was seen as no match for well-trained and state-of-the-art Iraqi forces. What happened in the next eight years not only brought about the death of some 200,000 Iraqis (and close to one million Iranians), but totally ruined the Iraqi economy – and ultimately brought about the ignominious end to the Iraqi President. Hopefully, other world leaders at the time took note.